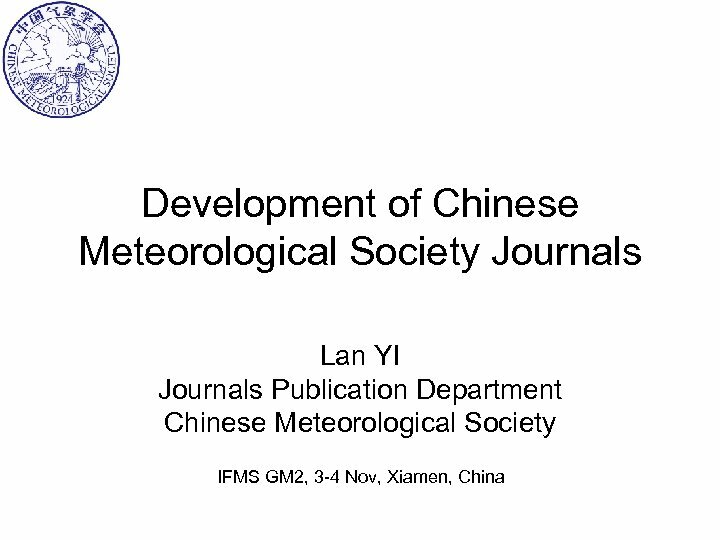 History • The Chinese Meteorological Society was officially established on 10 Oct 1924 in Qingdao, China. 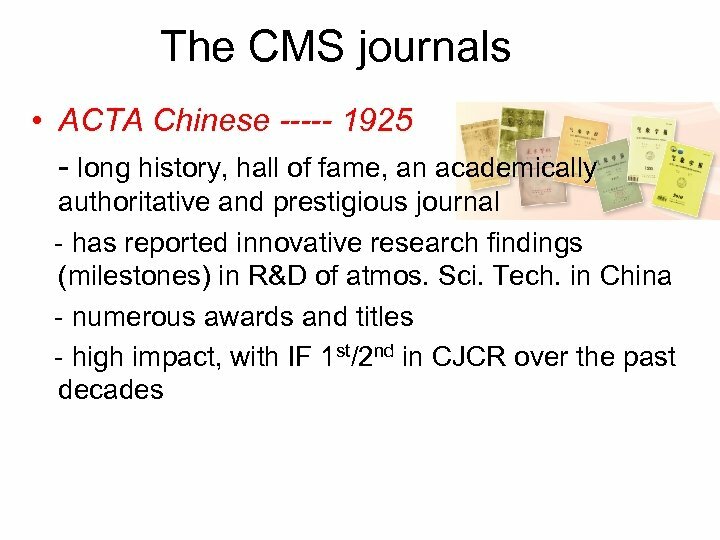 • In July 1925, the Journal of Chinese Meteorological Society (JCMS) began its publication. 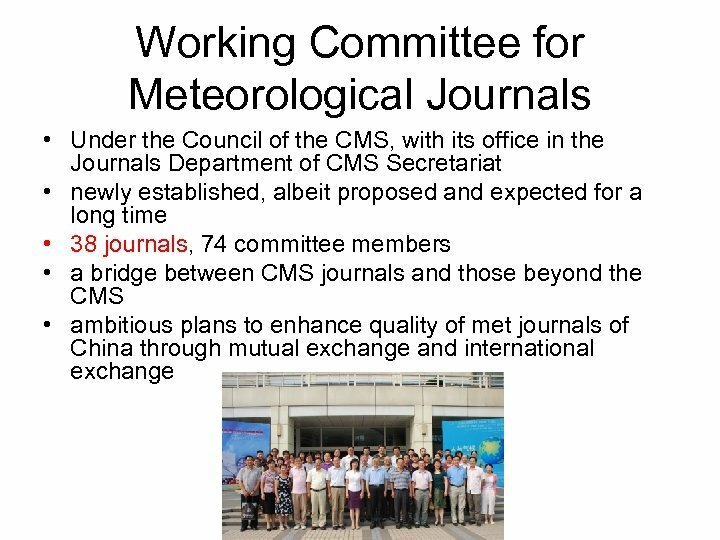 • In June 1935, the 11 th Council of CMS decided to change the journal title into Meteorological Magazine and made it a monthly periodical. 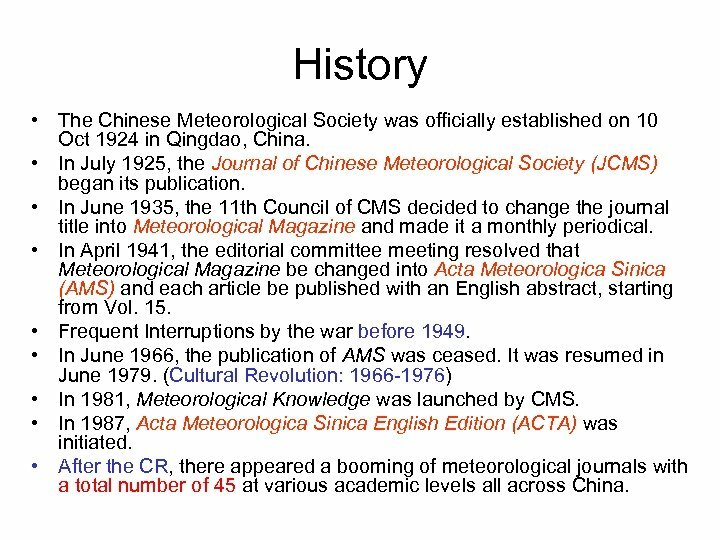 • In April 1941, the editorial committee meeting resolved that Meteorological Magazine be changed into Acta Meteorologica Sinica (AMS) and each article be published with an English abstract, starting from Vol. 15. • Frequent Interruptions by the war before 1949. 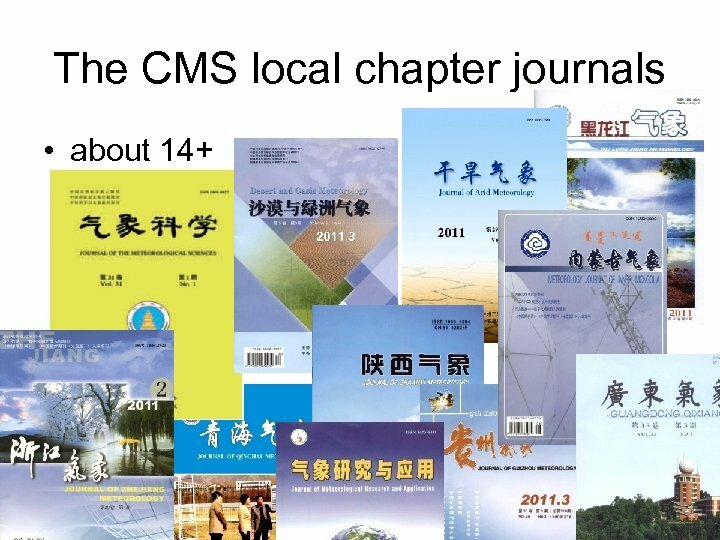 • In June 1966, the publication of AMS was ceased. It was resumed in June 1979. 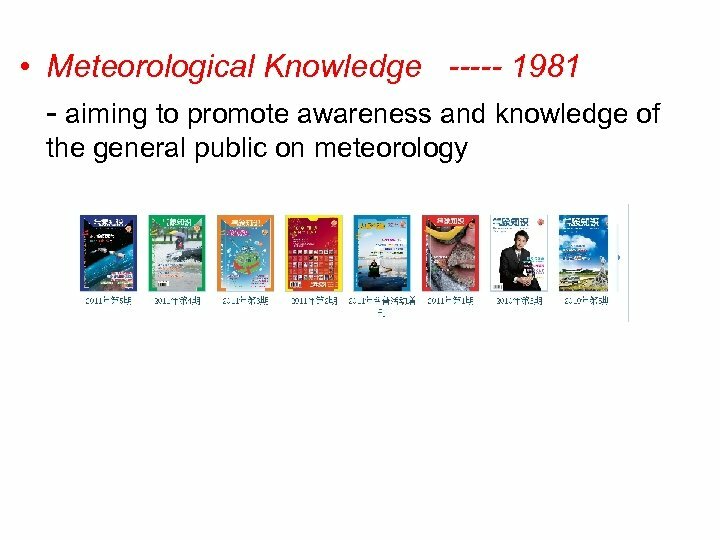 (Cultural Revolution: 1966 -1976) • In 1981, Meteorological Knowledge was launched by CMS. 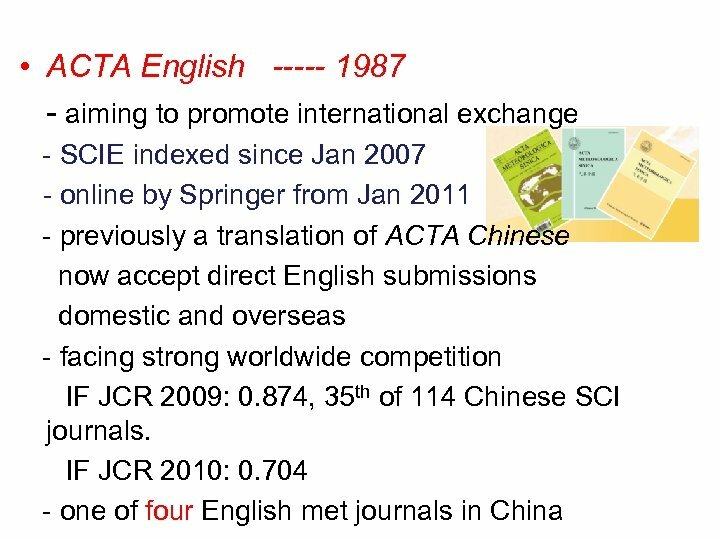 • In 1987, Acta Meteorologica Sinica English Edition (ACTA) was initiated. 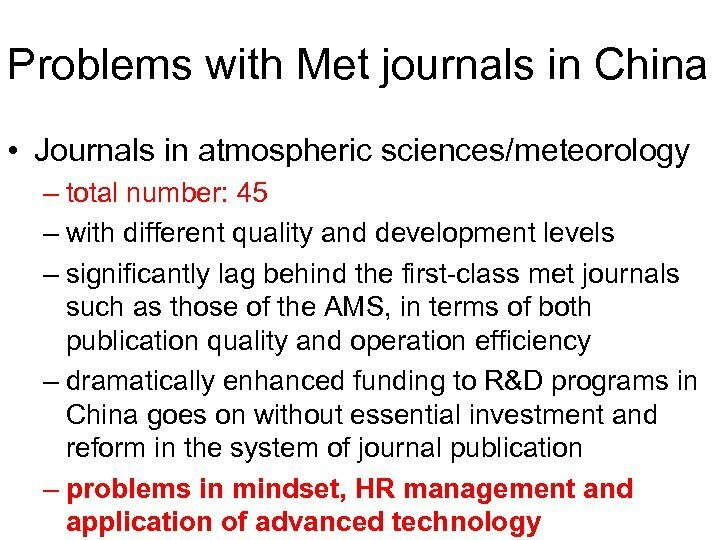 • After the CR, there appeared a booming of meteorological journals with a total number of 45 at various academic levels all across China. 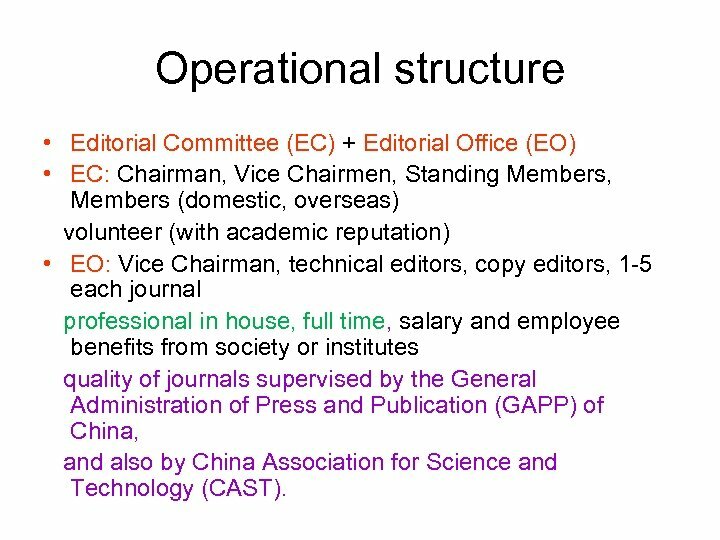 Operational structure • Editorial Committee (EC) + Editorial Office (EO) • EC: Chairman, Vice Chairmen, Standing Members, Members (domestic, overseas) volunteer (with academic reputation) • EO: Vice Chairman, technical editors, copy editors, 1 -5 each journal professional in house, full time, salary and employee benefits from society or institutes quality of journals supervised by the General Administration of Press and Publication (GAPP) of China, and also by China Association for Science and Technology (CAST). 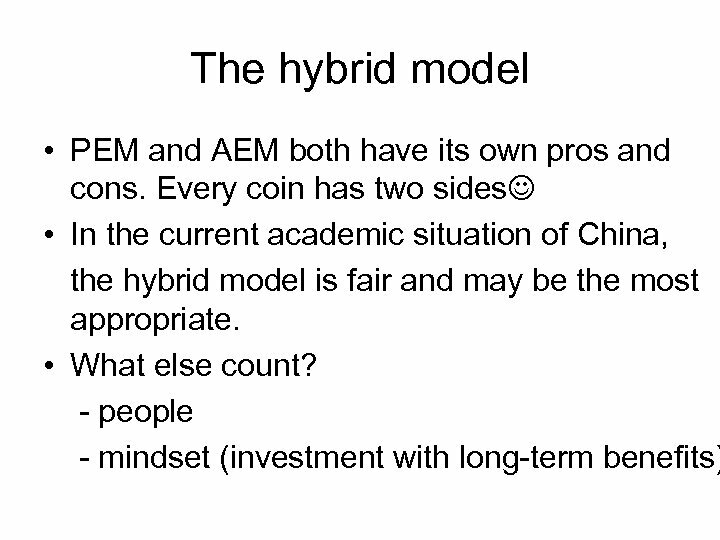 Differences： 1. 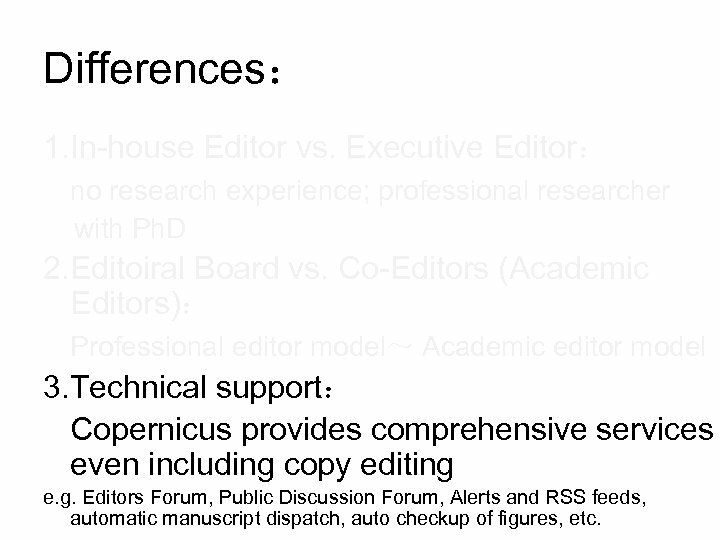 In-house Editor vs. Executive Editor： no research experience; professional researcher with Ph. D 2. 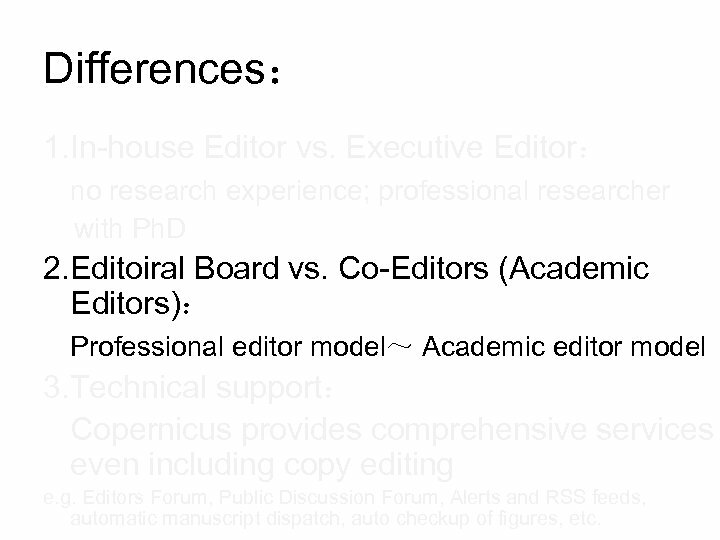 Editoiral Board vs. Co-Editors (Academic Editors)： Professional editor model～ Academic editor model 3. 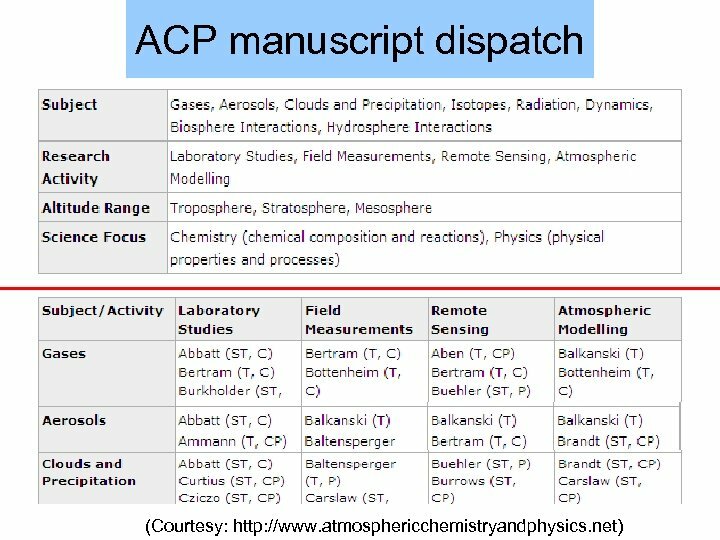 Technical support： Copernicus provides comprehensive services even including copy editing e. g. Editors Forum, Public Discussion Forum, Alerts and RSS feeds, automatic manuscript dispatch, auto checkup of figures, etc. 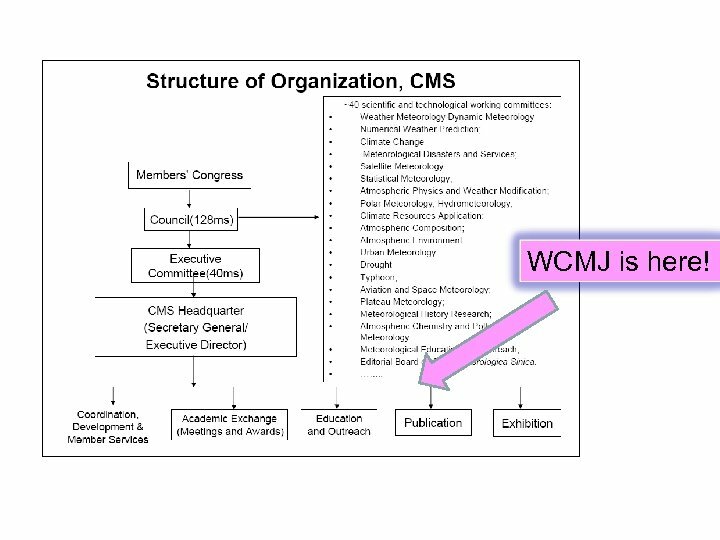 Common models used by academic journals n Professional Editors Model (PEM): In. 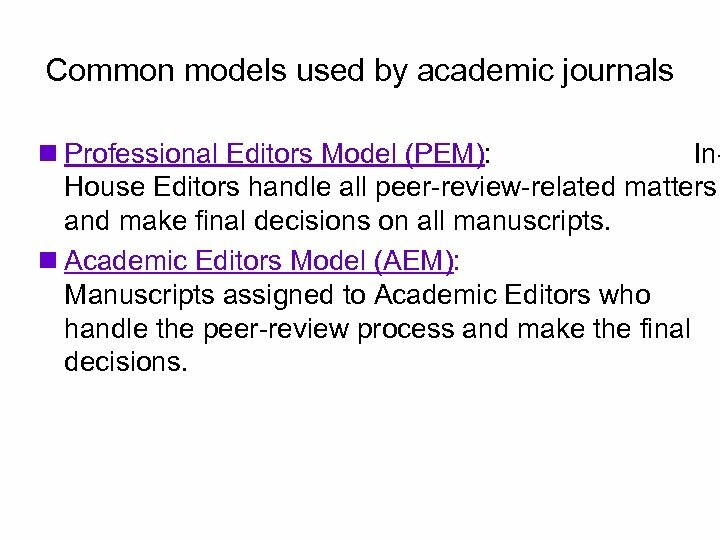 House Editors handle all peer-review-related matters and make final decisions on all manuscripts. 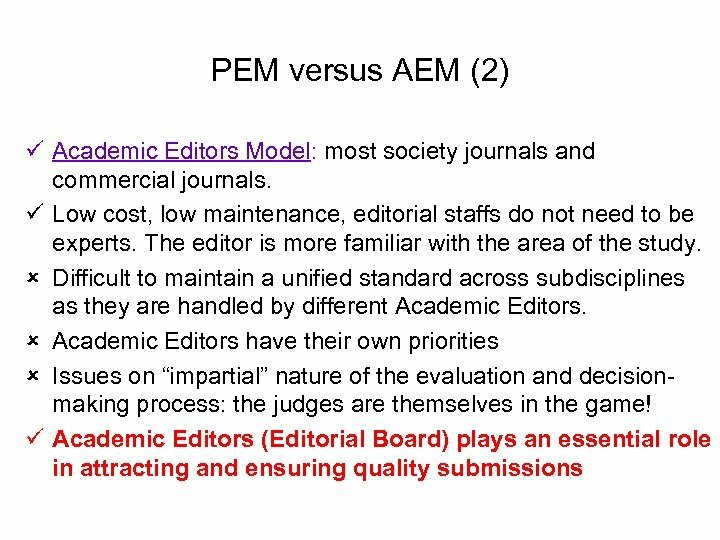 n Academic Editors Model (AEM): Manuscripts assigned to Academic Editors who handle the peer-review process and make the final decisions. 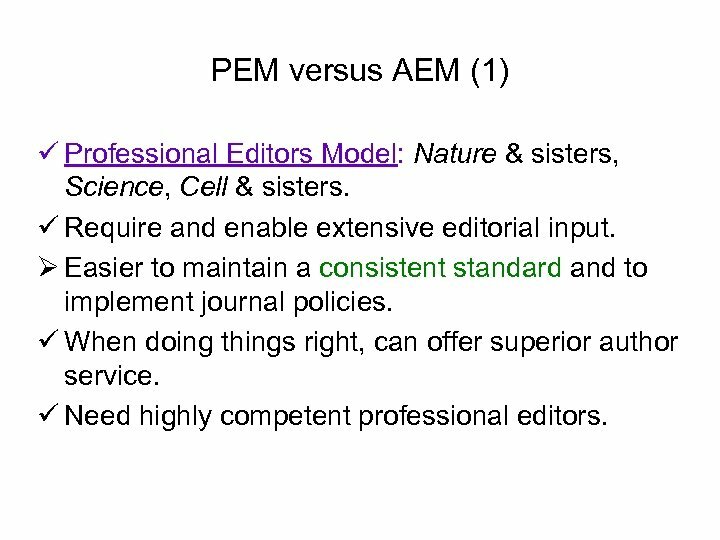 PEM versus AEM (1) ü Professional Editors Model: Nature & sisters, Science, Cell & sisters. 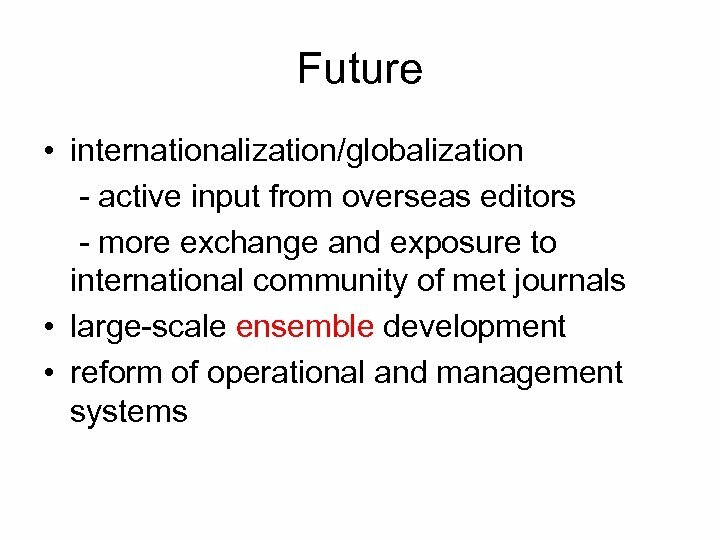 ü Require and enable extensive editorial input. 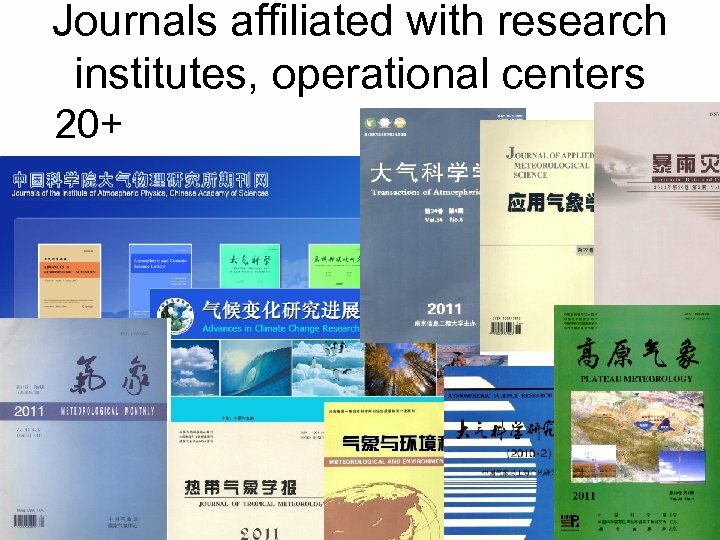 Ø Easier to maintain a consistent standard and to implement journal policies. 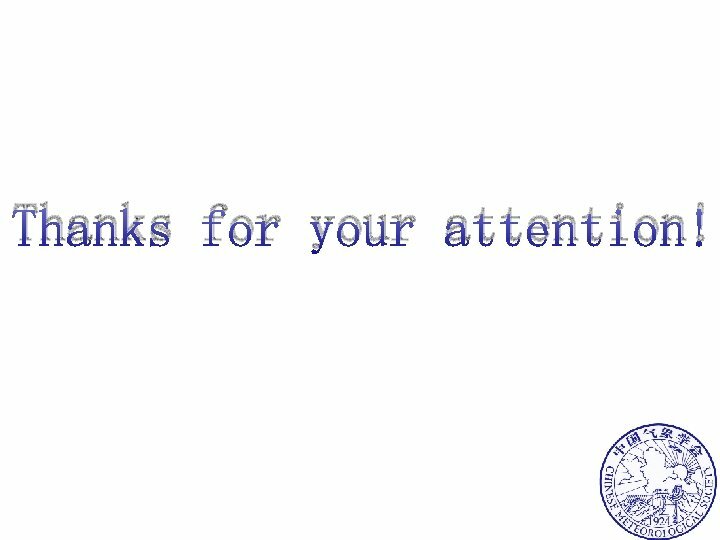 ü When doing things right, can offer superior author service. 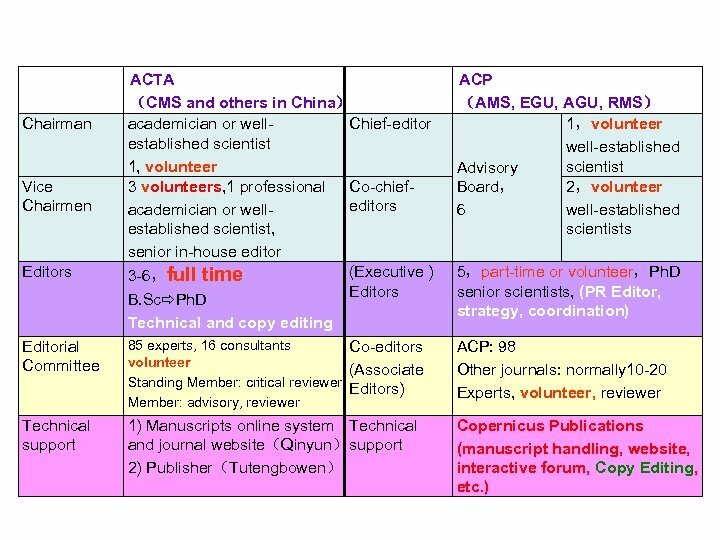 ü Need highly competent professional editors. 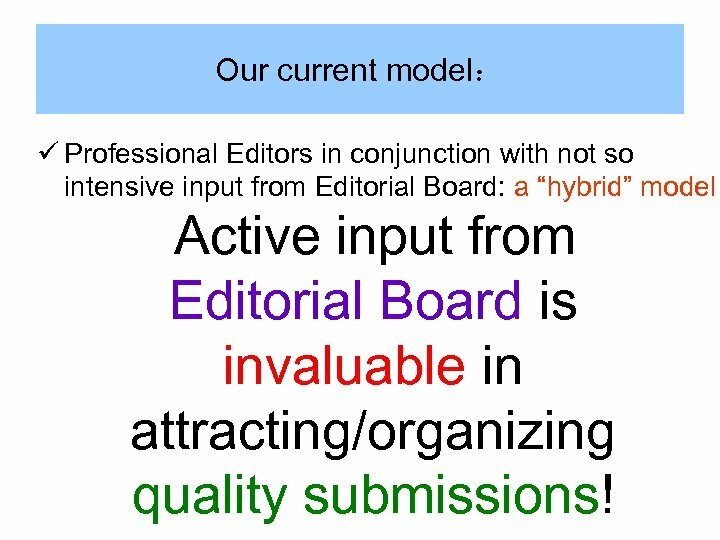 Our current model： ü Professional Editors in conjunction with not so intensive input from Editorial Board: a “hybrid” model Active input from Editorial Board is invaluable in attracting/organizing quality submissions! 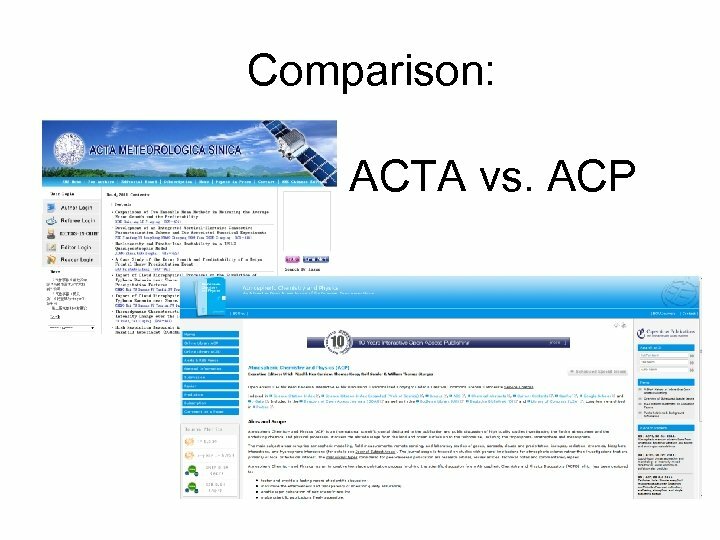 Solutions • advanced technology and strong IT support! • capable and talented human resources! 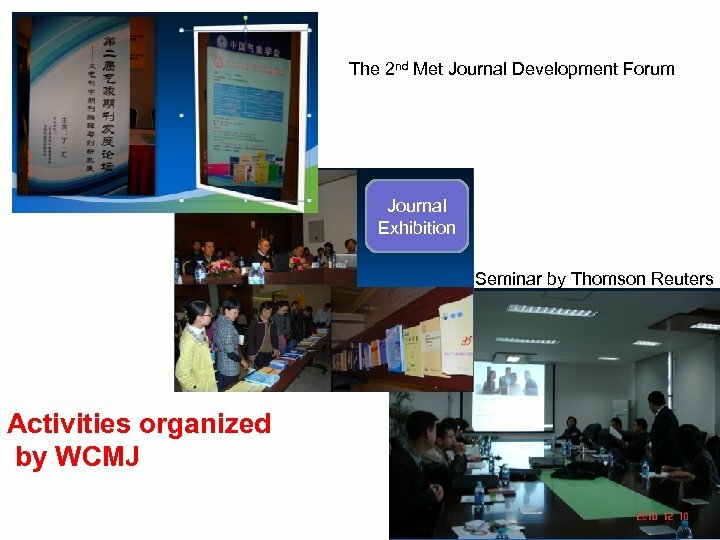 • new mindset in operating the journals!